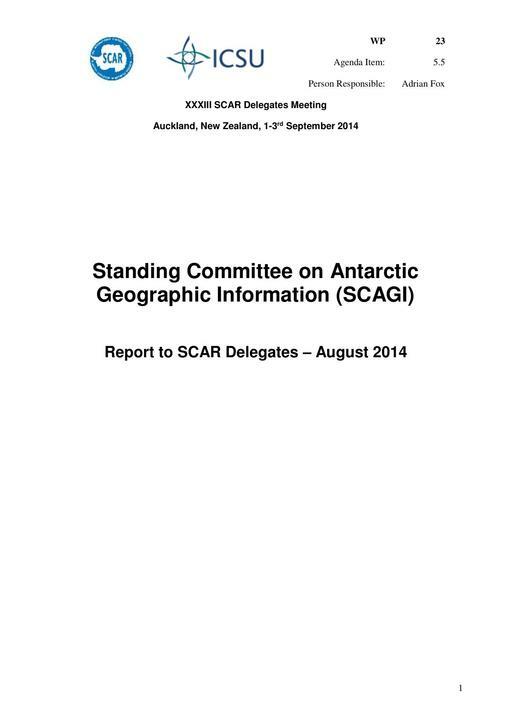 All work in Antarctica relies on a consistent geographic framework, and the main function of the Standing Committee on Antarctic Geographic Information (SCAGI) is to manage and improve the geographic framework not only for Antarctic scientific research but also for other activities including operations, environmental management and tourism. SCAGI continues to deliver, and actively develop, a range of Geographic Information products through its various projects. These products include: the SCAR Composite Gazetteer of Antarctica, the SCAR Antarctic Digital Database, and the SCAR Map Catalogue. The usage statistics included in the report below show that these are active products that are used and valued by the Antarctic community. Recommendations/Actions and Justification: Delegates should ensure that they are familiar with the work that SCAGI does and encourage their national representatives to become involved with and contribute all new data to SCAGI products. Delegates should ensure that retiring national representatives are replaced with a successor national representative and that the SCAGI co-Chairs are informed of this change. Expected Benefits/Outcomes: Wider engagement by the Antarctic community would help SCAGI to continue to develop, and deliver effectively, reliable relevant Geographic Information Services to the Antarctic science and operations communities. Maintaining the position of SCAR as the source of Geographic Information Services such as the ADD and CGA supports the SCAR Strategic Plan objective of an international leadership role for SCAR. Budget Implications: For the SCAR CGA and SCAR ADD to be improved, it requires that, either SCAGI members take on the necessary work or the work is outsourced. Continuation of $4k a year allocation.